To pay by credit card: from your cart, click "Check Out - Pay without a PayPal account" (instead of "PayPal Check Out"). The Unaligned is a sturdy, unique, knee-length skirt with multiple large pockets. Seven belt loops: three in front, four in back (two in center back). Note: some photos are of a prototype with only five belt loops; actual product has seven. Bull: has a solid-color look because it's made from yarn that's all the same color. Unlike classic denim, which has a two-color look because its warp yarns are blue and its weft yarns are white. Note: On skirts made in the second production run, the two rear belt loops are shifted about two inches to the left of where they're meant to be: centered at the top of the diagonal seam rather than at the garment's true center. This includes all grey skirts, and black skirt sizes 30-31, 32-33, 34-35, and 40-41. These tend to cluster around certain dates because we send out feedback requests to bunches of recent customers at once. The Aqueous is a heavy, fluid, unique, knee-length skirt with large hip pockets and belt loops. The name refers to its smoothly-flowing drape and swirling seamlines. Plain weave is the simplest of weaves: a simple over-under pattern that produces a strong fabric that's the same on each side. Contrast with twill, the weave that produces diagonal lines and is used in denim (and our Unaligned Skirt). These tend to cluster around certain dates because we send out feedback requests to groups of recent customers at once. 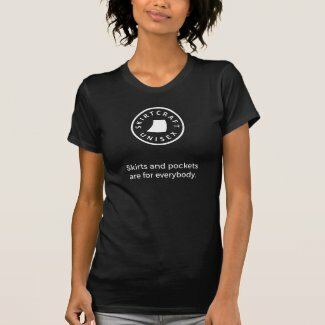 These shirts are our design, but they're sold, printed, and shipped by Zazzle. We receive 10% of the sales price. Many colors! Be sure to select the product below with the white graphics if you'd like a darker-colored shirt, or the black graphics for a lighter-colored shirt. 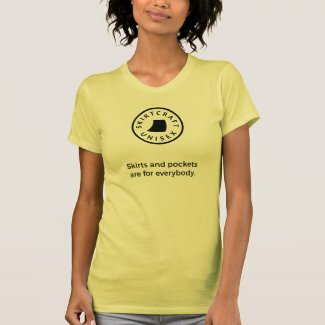 Once you're at the Zazzle product page you can select the shirt's color and size. Some of the lighter colors have lower prices. You can also apply the design to another style, like a long-sleeved shirt or a tank top. Cities/towns we've shipped skirts to! The latitudes and longitudes shown in this map are not derived from precise addresses; they're city/town locations only. Purple markers indicate places to which we've sent multiple orders. 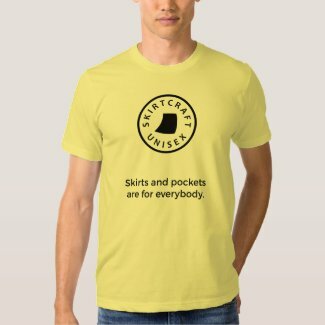 Skirtcraft is a micro-brand based in Minneapolis, Minnesota. Our products are Made in the USA, at a factory in Los Angeles, California. Our first product, the Unaligned Skirt, was launched via a Kickstarter campaign in the summer of 2015. We did a 2nd factory run in the fall 2017. The Aqueous Skirt, our second product, was also launched through a Kickstarter campaign, in the summer of 2018. A while ago, I wanted to start wearing skirts. I'd realized they were cool, and that I hadn't considered them before because I'd thought of them as being just for women (I'm a man). But it occurred to me that they really weren't—except by convention, and even then, only in certain parts of the world. I was missing out on one of the most basic forms of human clothing for no good reason! Looking for my first skirt, I found a wide variety of excellent products, but none that quite had the style I was looking for. 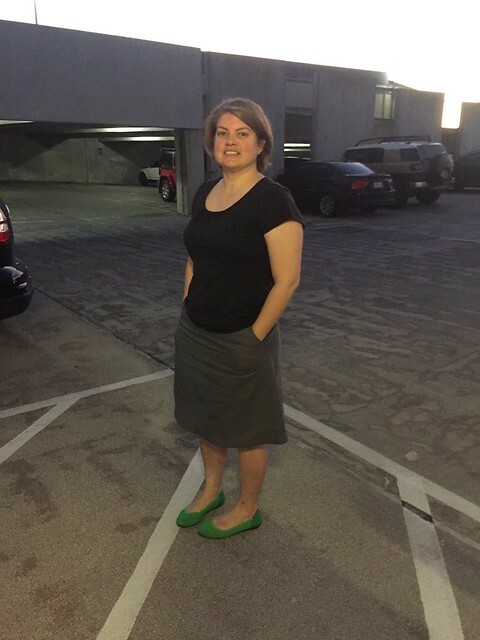 I'd been learning to sew at the time, so I decided one of my first projects would be a skirt. 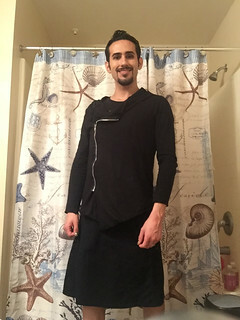 After about a year experimenting with different ideas, I arrived at a design I was excited about, and started exploring developing it as a product: the Unaligned Skirt. Having done 20+ design iterations, in April 2014 we registered Skirtcraft LLC and started sharing prototype photos online and collecting feedback. In September 2014, we began working with Clothier Design Source on developing the design into a product for manufacture: pattern formalization, materials sourcing, size grading, and testing. In June 2015, we settled on a partner factory to make the skirt in the U.S.
From July 21st to August 20th, 2015, we conducted a Kickstarter campaign to fund the initial production run. Thanks to 177 backers from 16 countries, it succeeded! 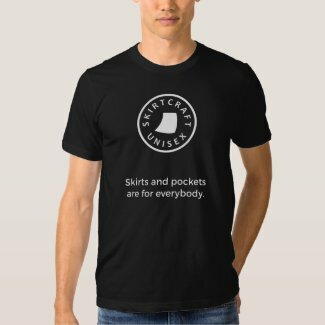 Your Skirtcraft waist size may or may not be your usual size. Select a pair of pants/trousers, or a skirt, that fits you well. Preferably of a heavier fabric like denim, and not stretchy. Lay it out flat. Pull the waistband from the sides so that it is lying nearly in a straight line (but not stretched). Measure the waistband from left to right. Compare the measurement to how the skirt sizes measure in the following table. Keep in mind that there is some variation between skirts of a given size, so your skirt's measurement may be off by up to about 3/8 inch (1 cm) from the values given. Sizing differs from brand to brand in general, partly due to vanity sizing. Some people like to wear the waistband lower on their hips, while others prefer it be closer to their natural waist. So two people with the same true waist size might want two different skirt sizes. Since you won't be able to try on different sizes before choosing, it's critical that we have an objective sizing method that allows you to clearly figure out your correct size at home. Kneel. Measure the distance from the floor to where you'd like to wear the top edge of your waistband. Measure at the side of your body rather than the front or back. That measurement is approximately how long a skirt would need to be to reach the middle of your knees while standing. If the measurement is less than the skirt length, the skirt will fall below the middle of your knee. If more than the skirt length, it will fall above. Several people who've tested the skirt have liked it longer or shorter than mid-knee. It just depends on your preference. We would like to offer more waist sizes and more lengths, but it's difficult to do so given our small scale and factory minimum order quantities. If you do some sewing and are wondering about shortening the skirt yourself: yes, it is possible. See DIY Alterations. The fabric is pre-shrunk, but may shrink up to 1 inch in waist circumference and 1 inch in length after washing. Some of the shrinkage goes away again as you wear it. We typically ship within 48 hours of receiving an order. All orders are shipped via United States Postal Service. US orders use Priority Mail and typically take 1-3 days after you receive notification of shipment. Non-US orders use the First Class Package International service and typically take 7-21 days after you receive notification of shipment. Skirts are shipped in mailers that are made of 95% recycled material (55% post-consumer), and are recyclable with mixed paper. We happily accept returns and size exchanges! The product must be unworn, unwashed, and in the same condition as it was when you received it. The shipment to us should be postmarked within 30 days of your receipt of the original shipment. For exchanges, we'll cover the cost of shipping the new skirt to you. For returns, the shipping charges you originally paid will be refunded. You are responsible for the cost of shipping the exchanged or returned item back to us. Wash and dry the skirt at least once so any shrinking is accounted for. Trim off the desired amount of fabric at the bottom. Leave an extra 1/2 inch for the hem. Finish the edge with a serger, overlock foot, or zigzag stitch. Press the new hemline, 1/2 inch from the finished edge. Fold the hem under along the pressed line and sew a plain stitch about 3/8 inch in. If you would like your Unaligned skirt to be shorter and are interested in altering it yourself, here's how to do it. Before proceeding, remember that the skirt will shrink by about 1/2 inch the first 1-2 times it is washed. Altered items cannot be returned or exchanged. This is the easiest approach. The drawback is it leaves layers of pocket fabric in the hem, which can make the hem hang in a more rigid and boxy way at the sides. Wash and dry the skirt twice, machine washing with cold water and drying on tumble dry medium, or however you intend to normally dry it. This step is to ensure that any shrinking will be resolved and taken into account when deciding on the new length. Decide how much shorter you'd like the skirt to be. We'll call this the Length Adjustment. For our examples, the Length Adjustment will be 3 inches. Determine the fabric width you'll be removing from the hem. If you are planning to use a serger, the width should be the Length Adjustment minus 7/8 inch. If you don't plan to use a serger, the width is the Length Adjustment minus 5/8 inch. In our example, you'd want to remove 2 1/8 inches if using a serger, or remove 2 3/8 inches otherwise. Use the scissors to cut off the hem edge, all the way around. The width to remove is the amount determined in the previous step. You'll notice more resistance as you cut through the extra layers of pocket fabric on the sides. If you have a serger / overlock machine, serge the new raw fabric edge, removing 1/4 inch of fabric in the process. If you don't have a serger, sew a zig-zag stich as close to the edge as possible. Fold the new hem edge 5/8 inch in from the edge, folding it toward the interior. In other words, the raw folded edge will be inside rather than outside the skirt. Press the new *inside* edge with the iron to make the folded edge crisp. Be sure to have the iron no higher than the Cotton setting. The reason for pressing from the inside is to prevent the iron from damaging the visible exterior of the skirt. It's easy to end up with shiny patches when pressing folds like this, since all of the iron's pressure is on a small amount of fabric. Pin the folded hem in place. With the top-stitching thread, sew a basic lockstitch all the way around the folded edge. This stitch should be from the exterior of the skirt and should be 1/2 inch from the folded edge. Be sure to remove pins before they reach the machine! Only a little more complicated than Option A. The hem won't have the extra weight, and will hang properly. However, there will be one additional, visible, horizontal stitch across the side panel, near the bottom. Locate the bottoms of the lower pockets from the inside of the skirt, about 1 inch from the hem edge. Notice that there are two layers of fabric that form each pocket bag, and these are not visible from the outside of the skirt. These layers are attached at either side by the skirt's main side-panel seams. Make two vertical cuts upward from the bottom edge of the pocket. Each cut should be just 1/4 inch inside the seam. The length of the cuts should be the Length Adjustment plus 1/2 inch. In our example, the cuts would be 3 1/2 inches. If you're using a serger, serge the pocket layers between the two cuts, all the way across. The width of fabric removed should be equal to the Length Adjustment, and this will leave behind 1/2 inch of the cuts. The extra cut length was just to allow the serger to get in there. If you're not using a serger, sew a zig-zag stich across the two interior pocket layers between the cuts. As with the serger, there should be 1/2 inch of cuts left behind. Cut across the pocket layers just below the zig-zag stitch, causing the portion between the cuts to be removed. From the outside of the skirt, with the top-stitching thread (or plain if you prefer) sew a plain lockstitch from left to right across each side panel. The stitch should run across the full width of the pocket, starting and ending in the primary seams that form the side edges of the pocket. It should be 1/4 - 1/2 inch above the tops of the cuts. It forms the bottom edge of the usable pocket interior. Take care to make this stich very straight since it's visible. Putting a strip of masking tape in place as a guide for the stich can simplify this. Determine the fabric width you'll be removing from the hem. If you are planning to use a serger, the width should be the Length Adjustment, minus 7/8 inch. If you don't plan to use a serger, the width is the Length Adjustment minus 5/8 inch. In our example, you'll want to remove 2 1/8 inches if using a serger, or remove 2 3/8 inches otherwise. Use the scissors to cut off the hem edge, all the way around. Remove the width of fabric determined in the previous step. You'll notice more resistance as you cut through the extra layers of pocket fabric on the sides. If you have a serger / overlock machine, serge the new raw fabric edge, removing 1/4 inch of fabric. If you don't have a serger, sew a zig-zag stich as close to the edge as possible.